We are perfect for any kind of traveler; for those that are easy going, enjoy outdoor activities, meet cool people and of course, party! 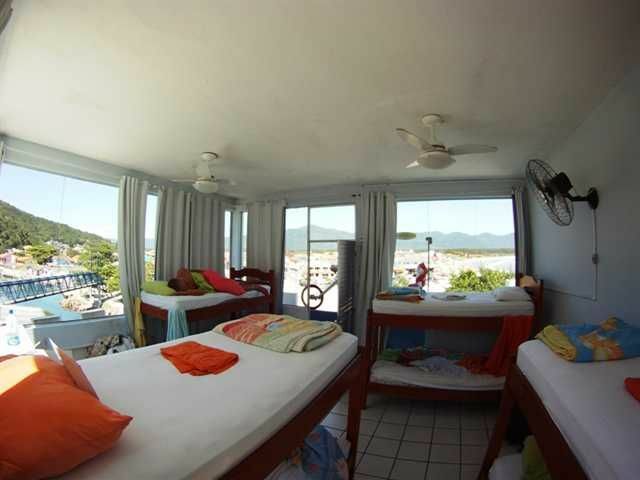 We’re a bus away from popular surf beaches like Moçambique, Mole and Joaquina, and to the night life of Lagoa da Conceição. 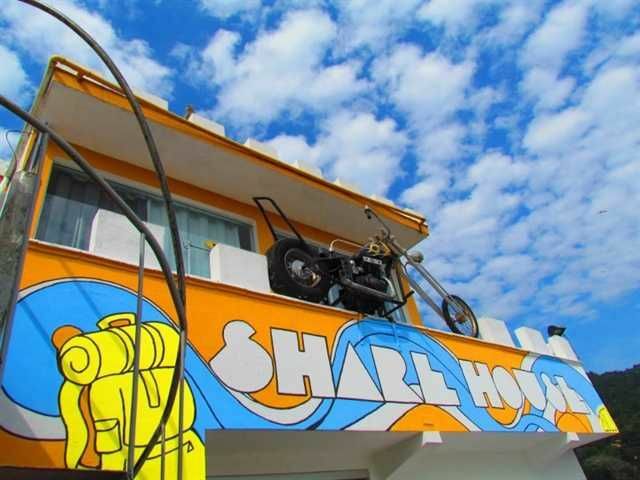 Want to go check out the best clubs in Florianopolis day trip to the south of the island? Don’t worry; we arrange trips and transfers to wherever you want to go! Our outdoor terraces offer you the best views to enjoy the sunset, read a book and lay in the hammock to get a tan. 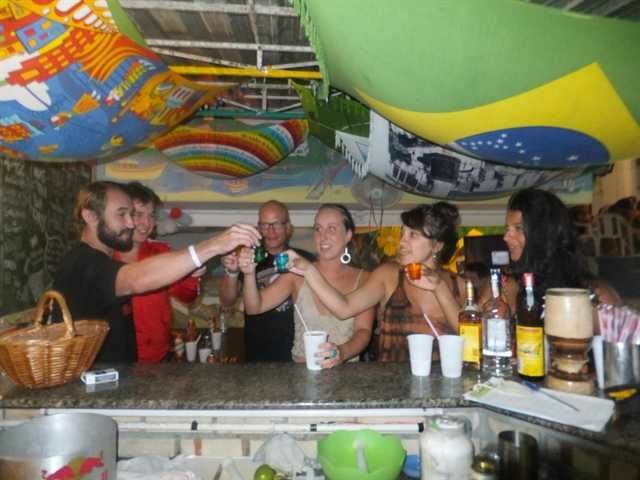 The bar and dinner area are perfect social areas to enjoy our meals and Caipirinha o’clock with the other backpackers. There are exits to the canal where you can go and explore the lake kayaking (its free from here) or get a short cut to the surfing.PLEASE READ CAREFULLY THE IMPORTANT INFORMATION FOR FURTHER DETAILS REGARDING CANCELLATION FOR SPECIAL DATES! From the Bus Station:When you arrive at Florianopolis bus station, walk straight out of the doors facing Floripa Centro. Turn right and five minutes walk to the south (past the bus terminal car park) is the local bus station. The bus to Lagoa Da Conceicao leaves from the second-last stop at the end of the middle platform. This bus is #330 or #320. Ride this bus to the Lagoa Terminal. Here, change to bus #360 to Barra Da Lagoa and ride until the final stop. Over the footbridge is The Backpackers Share House on your left. This journey should take 50 min and cost R$ 2, 95. Change is rare, so don’t try to pay with a big bill. These blue buses run from 5.50 am until 11.30 pm (occasional buses run later).By Taxi: Walk out the doors and ask a driver to take you to Barra Da Lagoa, preferably in Portuguese or Arabic. It will cost around R$50.00. Again, when you arrive in Barra Da Lagoa, walk over the footbridge and find the Backpackers 20 meters up the path on your left.From the Airport:By Bus - Walk out of the airport and go to the bus stop outside. Catch green bus #183 or #186 which comes every ten minutes. Written on the bus is Corredor do Sudoeste. Get off at the local bus station and follow the directions from above. This bus will cost you R$ 1.80 and take you 25-30 minutes during rush hour. It runs from 5.30 am until 12.30 pm.If you wish we can pick you up. Contact us!